On Monday, October 12, Babu Ji chef Jessi Singh and his wife will team up with fellow New York City chefs Ann Redding and Matt Danzer (Uncle Boons), Matt Lambert (The Musket Room) and Richard Kuo (formerly of Pearl & Ash) for an incredible Indian meal. 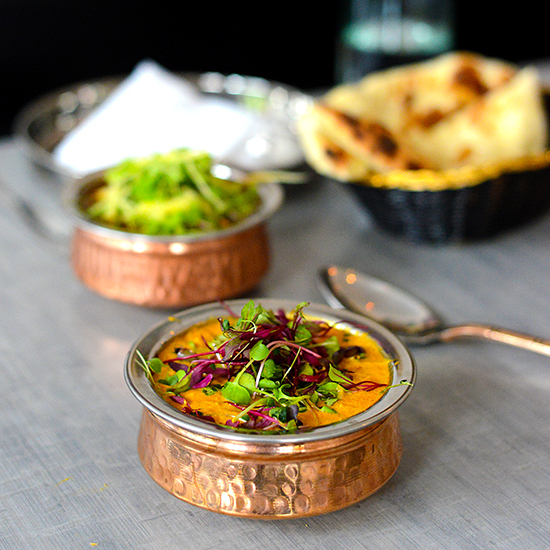 New York City's Babu Ji offers creative and delicious Indian dishes like yogurt croquettes with bright beetroot ginger sauce and housemade cardamom, honey and pistachio ice pops. If that's not enough to get you into the restaurant, maybe this will push you over the edge: On Monday, October 12, Babu Ji chef Jessi Singh and his wife will team up with fellow New York City chefs Ann Redding and Matt Danzer (Uncle Boons), Matt Lambert (The Musket Room) and Richard Kuo (formerly of Pearl & Ash) for an incredible Indian meal featuring a variety of street food–inspired starters and curries, plus fantastic desserts from OddFellows Ice Cream. Proceeds will benefit ATMA Organization and Aasha Foundation, two nonprofits working to provide education to India's disadvantaged children. Get your tickets online here.